This past week in San Diego at Comic-Con you could barely turn a corner without seeing some promotion for the Guardians of the Galaxy. It was everywhere. 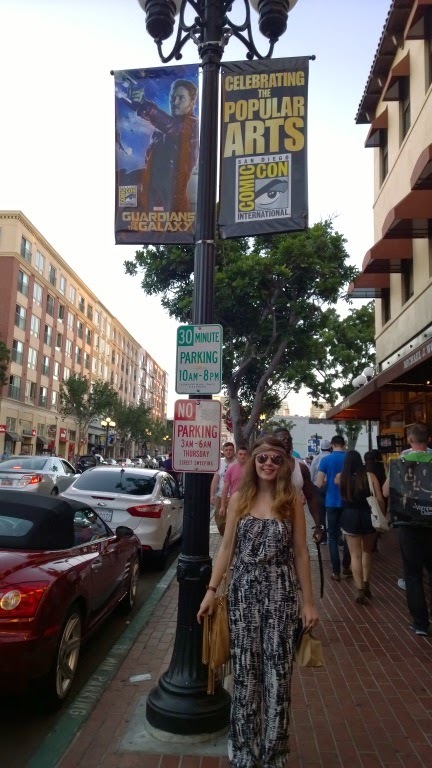 Signs could be seen on almost every lamp post within 6 blocks of the San Diego Convention Center. People were talking about it too. Leading up to Comic-Con there was plenty of promotion for this movie but for those of us that may have not read any of the Guardian of the Galaxy comics before now this movie could look a little silly. Bradley Cooper as a racoon? Vin Diesal as a Tree Monster? And, unless you watch the TV show Parks and Recreation, you may not even recognize the lead actor in this new summer Blockbuster. Regardless of these concerns our crew set out this afternoon to go see the movie on opening day. Our oldest son took our youngest. There were some concerns for both of them as they are both Guardian fans going into the movie. But along with being a Guarding fan our oldest is also a screaming child magnet. So, going to a summer family movie during the matinee showing was kind of a risk. They like to go to a movie to watch the movie which can be tough on opening day with a theater filled with screaming kids. Guardians of the Galaxy is good. It's so good, that it kept a theater full of kids, teenagers, and adults with cell phones engaged enough to all stay quiet when they were supposed to. I've come to expect a certain lack of theater etiquette for summer movies (doubly so on their opening weekends), so this was something of a small cinematic miracle to me. It's story of a band of misfit adventurers stumbling into a conflict that threatens the safety of the universe moves by at a lightning fast pace, which works excellently by keeping the focus on the characters rather than the details. There is a whole lot of information for fans of the comic books in the background, but none of this needs to be decoded by the audience in order to keep up with the plot. This focus on character is also what makes the action feel more intense without needing anything more visceral than laser guns, and the comedy that much more effective even when it gets a bit ruder than something a 15 year old could catch. Everything that made the Avengers work so well is here, but just a bit sharper and a bit louder. Go see Guardians of the Galaxy.